Gibby was more observer than participant today. The Araucauna rooster, who was supposed to be a hen, flew out of the big cage just as I stepped in to fill the feeder - he flew so close to me that it felt like his wing did a push-off on my shoulder. A couple times in the past, he rushed around when I stepped into the cage, but this looked like a planned escape. The time I had to play with Gibby was spent trying to recapture the rooster. I don't know why any bird would want to be loose in a yard full of twenty or more cats, but this guy didn't seem to see the cats as any kind of threat. He marched right up to some of them and scared others. 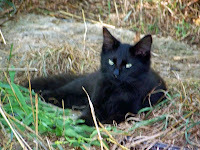 At one point, he dove into the waist high weeds in front of the red house and must have landed right on a cat, because there was a sudden explosion and a flash of cat above the weeds headed to the left while the rooster headed to the right. Every time I tried to head the rooster off, he flew or ran in the opposite direction. 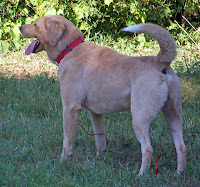 Somehow, he knew he shouldn't head toward the yard where the dogs were waiting. He went that way once but immediately turned back. At first, Gibby and Patches were barking, but then became very silent. For another half hour, they just watched. Finally, I realized the Araucauna hens were all roosting, so I opened the gate and left it open. 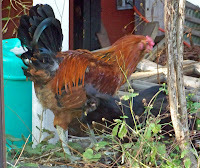 The rooster was on the porch of the old red house where some antique chairs were piled, waiting to be refinished. He heard me approach and ran into a dead end. He was caught between the chairs and a wall and couldn't get out, but I couldn't figure out how to get him out either. I moved some of the chairs and let him loose. He ran right away toward the chicken cage - ran past, and then turned back and went right into the cage. Whew. 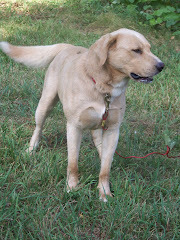 Gibby must have watched carefully, because he barked again the minute the cage door closed.